"I have seen growth in myself and my school. I know teachers in my school are using the new approaches because they present their lesson plans to me. I see teachers reading aloud every day. I see children writing, writing, writing... We are moving forward." Teachers for a Better Belize is a partnership of professional educators from North America and Belize who volunteer their time to improve the training of teachers and the education of children in the Toledo district of Belize. TFABB aids Toledo's preschool and primary-school teachers and principals with the training, supplies, and facilities they need to help their students achieve academic success and thereby escape poverty. TFABB is an all-volunteer, U.S. 501(c)(3) nonprofit organization operating on a minuscule programmatic budget. 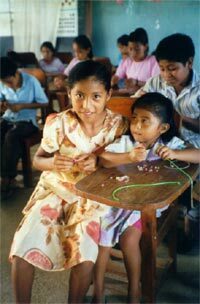 For a low annual outlay of less than $3 per student reached, our ongoing projects have meaningfully improved the education system of the entire Toledo district of Belize.